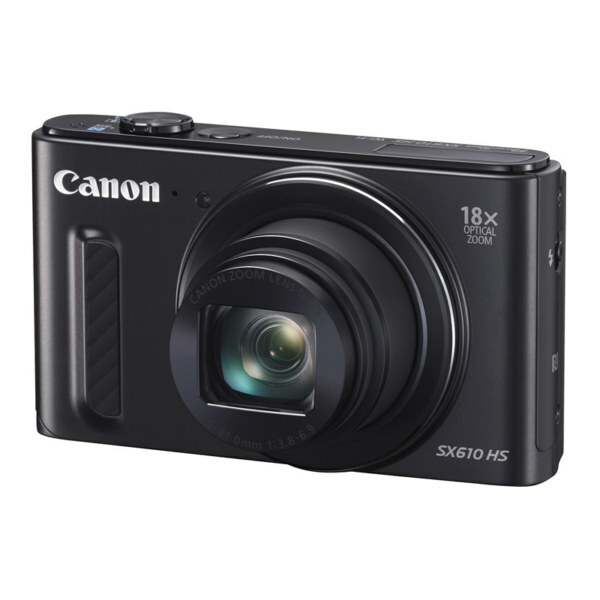 Capture clear photos and 1080p high-definition videos using this Canon PowerShot SX610 HS digital camera, which features a 20.2-megapixel 1/2.3″ CMOS sensor and a 25-450mm lens. Built-in Wi-Fi makes it easy to share stored footage across devices. Through a 25-450mm lens for precise zooming and accuracy. With 922,000 dots resolution and a wide viewing angle makes it easy to set up and review shots. Allows you to capture 1080p high-definition video footage in MPEG-4 AVC/H.264 format with MPEG-4 AAC stereo audio. Reduces the effects of camera shake and vibration to minimize blurring and ghosting. Adds artistic flair to your images using the original composition, color and lighting. With on, off, auto and slow synchro modes lets you add light to scenes when necessary. Combines short video clips into a highlight reel. Automatically selects the appropriate settings based on predetermined shooting situations. Helps bring your subjects into clear view. Makes it easy to connect your wireless devices for easy file transfer and remote shooting. To simplify image transfer via Wi-Fi and NFC.